Every young pirate needs a Spyglass-Telescope, and this one is movable too! 1. 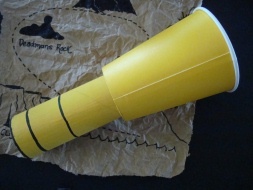 Paint your tp roll and paper cup, whatever color you'd like your spyglass. 2 Once they are dry trace around the tp roll on the bottom of your cup. Cut out the hole (this is where your roll will be inserted). 3. Next you need to make a ring out of paper. Trace around the bottom of your cup. Place the tp roll in the center of this tracing, and trace around the roll. 4. Cut out your ring. It should look like the picture. 5. Spread some glue around one end of the tp roll and glue on the ring (the ring will stop the tp roll from coming out of the hole in the cup). 6. Once the glue is dry insert the tp roll into the hole in the cup. Insert the end that does not have the ring attached. Now you can move you spyglass-telescope in and out. Draw on some black lines around your scope if you wish. Another option is to wrap some plastic wrap around the top of the cup; secure it with tape, and then cover the tape by gluing a strip of black construction paper around.